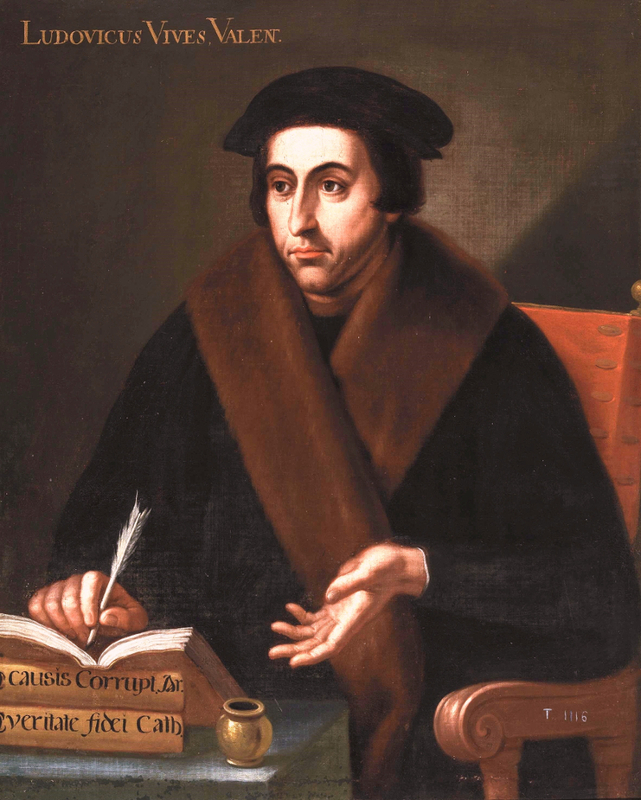 The humanist Juan Luis [Joan Lluis] Vives was born in Valencia in 1493. His family were Jewish converts to Catholicism; his father was tried and burned at the stake in 1524, and the remains of his mother, who had died in 1508 from the plague, were exhumed and burned publicly. Vives, who had attended the city’s newly founded university, left Spain in 1509. He did not return. He settled first in Paris and continued his studies with scholastic logic, but five years later he moved to Bruges, where he remained until 1516. It was at the court of Brussels that he met Erasmus for the first time and where the ensuing deep and enduring friendship, which became such a central feature in Vives’s life, began. The first surviving letters between the two men date to 1519, two years after Vives had taken up a position as tutor to Guillaume de Croÿ, bishop of Cambrai. Vives lived in Louvain, teaching at the Collegium Trilingue, until Croÿ’s death in 1521. His published work from these years include Fabula de homine (1518); De initiis, sectis et laudibus philosophiae (1518); In pseudodialecticos (1519); and, at the request of Erasmus, a commentary of Augustine’s De civitate Dei (1522). From 1523, Vives travelled repeatedly between Bruges and England, where he was appointed tutor to Mary Tudor, daughter of Henry VIII and Catherine of Aragon. Here he struck up friendships with English humanists such as Thomas More, and he accepted a lectureship at Corpus Christi, Oxford. In 1524 Vives married Margarita Valldaura, the daughter of Bernard Valldaura whose Valencian family of merchants had established itself in Bruges. In the same year, Vives published De institutione feminae Christianae, a work on the education of women, and Introductio ad sapientiam, following this with De subventione pauperum (1526), a treatise on the public relief of the poor. Political events in England overtook him, however, and the consequence of his support for Catherine of Aragon led to several months in 1528 during which he was placed under arrest before being allowed to return to Bruges. A number of financially difficult years followed for Vives before, in 1531, he received a pension from the Holy Roman Emperor Charles V and, seven years later, he became tutor to the noblewoman Mencía de Mendoza. By the time of his death in Bruges on 6 May 1540, Vives’s publications included De concordia et discordia in humano genere (1529); De disciplinis (1531); and De anima et vita (1538). De veritate fidei Christianae was published posthumously in 1543. The metadata for Vives’s calendar of correspondence has been compiled by doctoral student Cristina Erquiaga Martínez during the course of her work as an intern with EMLO. Digital Fellows Antonia Berschinger and Alex Hitchman helped to insert links to the texts available on Biblioteca Valenciana Digital [BIVALDI] (Biblioteca Valenciana Nicolau Primitiu), both the Spanish translations from the Delgado edition (for further details, please see below) and the Latin texts from the Opera Omnia (again, for bibliographic details, please see below). For their invaluable guidance and advice on Spanish scholarly correspondence, EMLO is indebted to Dr Theodor Dunkelgrün of St John’s College, Cambridge, and Sir Noel Malcolm of All Souls College, Oxford. Jose Jimenez Delgado, ed., Juan Luis Vives Epistolario (Madrid, 1978). Gregorio Mayans i Siscar, ed., Joannis Ludovici Vivis Valentini opera omnia (Valencia, 1782–90). This catalogue contains 195 letters that range in date between 1514 and approximately 1540 (in the case of those written by or to Vives) and 1555 (in the case of letters in which Vives is mentioned). Vives’s circle of correspondents was extensive and includes Desiderius Erasmus, Guillaume Budé, Henry VIII of England and his first wife Catherine of Aragon, Frans van Craneveldt, the Holy Roman Emperor Charles V, pope Adrian VI, and Philip II of Spain. The letters range in content from detailed discussions about the preparation of and publication of individual works by Budé, Erasmus, and Vives to the analysis of the current political events of the time — including Lutheran reform, the marriage of Henry VIII, the situation regarding European universities, the Italian wars, and the sack of Rome in May 1527. In particular, this correspondence reveals the deep and lasting friendships held between Vives and a number of leading intellectuals of his time and it reflects the quality of intellectual exchange in this particular period whilst shedding light on the teaching offered at Europe’s leading universities. At present the only Latin texts linked out to from this catalogue in EMLO are those for which the manuscript is held in the Library of the University of Leuven. Full manifestation details for these manuscripts will be uploaded early in 2018. Users should note also that for the letters sent to or by Frans van Craneveldt the origin or destination (depending whether Craneveldt is the author or the recipient) have been inferred as Mechelen, where Craneveldt served as City Councillor. In the coming months additional letters will be added to the calendar, including those letters that make up the ‘shadow archive’, namely those that no longer exist but which are known to have been sent or received from reference in a surviving letter. Lorenzo Casini, ‘Juan Luis Vives [Joannes Ludovicus Vives]‘, The Stanford Encyclopedia of Philosophy, ed. Edward N. Zalta (Spring 2017 edn), <https://plato.stanford.edu/archives/spr2017/entries/vives/>. Enrique González, Salvador Albiñana, and Víctor Gutiérres, Vives: edicions princeps (Valencia, Universitat de València, 1992). Joseph Ijsewijn and Ángel Losada, ed., Erasmus in Hispania, Vives in Belgio: acta colloquii Brugensis, 23–26, IX, 1985 (Leuven: Peeters, 1986). Gilbert Tournoy, Pour une nouvelle édition de la correspondance de J.L. Vives (Kortrijk: Campus Kortrijk, Preprint no. 77, 1992). Joan Lluís Vives, Antologia de textos de Joan Lluís Vives (Valencia: Universitat de València, 1992). Henry de Vocht, ‘Vives and his Visits to England’, Monumenta Humanistica Lovaniensia, 4. (1934), pp. 1–60.